Researcher Josélia Neves, who teaches at the Translation and Interpretation Department of Hamad bin Khalifa University in Qatar, visited Feevale University on Saturday, 10, during the Feevale Open Doors event. 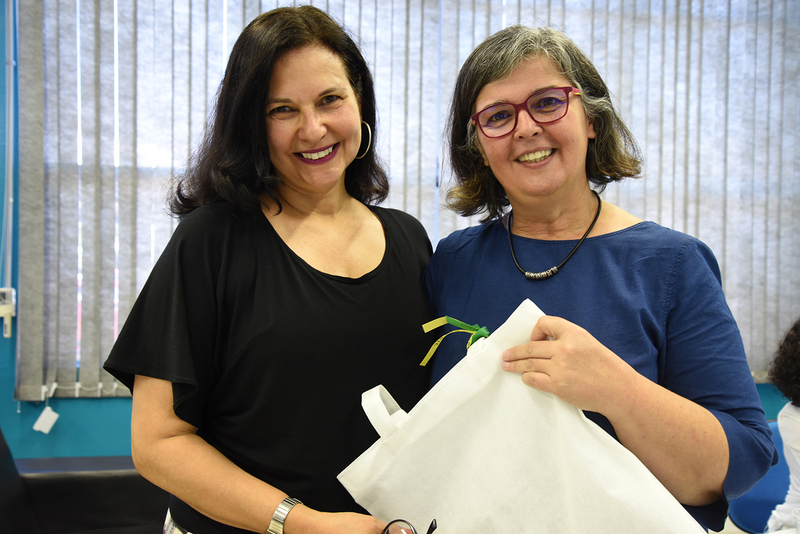 Josélia, who was accompanied by professors Eduardo Cardoso (Federal University of Rio Grande do Sul) and Sandra Farias (State University of Bahia), was welcomed by professor and researcher Regina Heidrich, who honored her for the partnership with Feevale, since when she was a teacher of the Polytechnic Institute of Leiria (IPL), Portugal. In Qatar, Josélia works on several fronts, including the scientific coordination of the master's degree in Audiovisual Translation and the orientation of research work on accessibility in the cultural context, focusing on cross-sensorial translation. Prior to that, he was a lecturer at the Leiria Polytechnic Institute (IPL) in the Portuguese city of Leiria. In June 2012 she was at Feevale, where she established several partnership actions, among which, with the masters in Cultural Diversity and Social Inclusion and in Processes and Cultural Manifestations.